Gossip Girl Review: "The Unblairable Lightness of Being"
Should Blair have forgiven Chuck? Will she and Dan hook up? Can Serena and Nate get past this? Should Jenny Humphrey be rolled up in a carpet and tossed off a bridge? Wedding bells were a-ringing on Gossip Girl Monday, but the joy experienced by long-suffering maid Dorota belied the deceit, drama and unraveling of other relationships. This is the Upper East Side, after all. A Dorota-centric episode might have made "The Unblairable Lightness of Being" boring at times, but was plenty to keep it compelling. Bittersweet and emotional, alternately scandalous and sweet, over-the-top serious and then hilarious (was that "I Got a Feeling" on accordion?! ), this was still vintage GG. We start with Chuck and Blair, still reeling from last week and the awful situation he put her in, and wants forgiveness for. He says they're inevitable, and he may be right. But did he push it too far this time, even by UES standards? 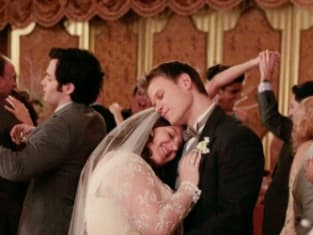 In typical Chuck fashion, he senses opportunity and goes for it, agreeing to throw Dorota a lavish wedding because he's such a good guy ... and wants Blair to realize it. It's not that simple, of course. They still dispute who’s at fault for what happened with Jack, and Blair confesses (to Dan of all people) that she’s also angry with herself. She doesn’t who she becomes when she's around Chuck. That's a new, interesting twist - B isn't just crushed, but questioning whether she and C even belong together. Vanya and Dorota happily wed, which really was cute, despite the obvious plot hole of how Chair qualified as the "happy couple" that the ceremony required participate. Afterward, Blair tells Chuck they can't be together because ... wait for it ... she’s afraid she loves him too much. It stings. She walks away into the arms of Dan to dance. Might this be the long-rumored Dan and Blair hookup that fans have predicted? Or just an innocent dance on the bumpy road that is the inevitable love story of Chair? Meanwhile, there's Jenny. Oh, there's Jenny alright. The devious one is still doing all she can to break up Nate and Serena, and it's not cool. However, Serena basically lobs her a softball by secretly meeting Carter Baizen. He's back in NYC with intel on her dad, which is basically what brought him here to begin Season 3. Naturally, Nate catches them sneaking around and naturally, S lies. Later, Serena explains to Nate that Carter knows something about her dad, and after distrustful Nate tells her not to see him, she snaps that he can't order her around. At Dorota’s wedding, Carter shows up and tells Serena that he knows where the doctor is and has been this whole time: Palm Beach, Florida. He also bought her a ticket. Of course, this being Baizen, there's always another layer. When S learns he held out on that info for a week just to have an excuse to see her, she goes to Florida solo. Probably for the best there, S. Guy is bad news! We love that Carter keeps coming back, but this time it seemed a tad forced. Maybe we'll be pleasantly surprised later. The drama continues when she calls Nate from Florida and Jenny picks up his GD phone. Serena asks Jenny to please have Nate call her, and to tell her she loves him. Jenny will be doing nothing of the sort, thankyouverymuch. What do you suppose Jenny's endgame is? No way this is going to end well. No way. Will her scheming get her what she wants, or ultimately drive her out of the UES? Meanwhile, there was a cute side plot with Eric and his new crush, Elliot, who he learns has a girlfriend, but is actually bisexual ... with a crush on Eric. That's a new one! Speaking of Humphreys, van der Woodsens and relationships, Rufus' story line is about to tie in to Serena's in a big way when Lily lies, of course, about her whereabouts. Does that woman ever tell the truth? When he can't get a hold of his wife and CeCe won’t tell him where Lily is either, Rufus remains clueless at the end. But we do not. When Serena knocks on the door to what we can only assume is her father’s hotel room in Florida, none other than Lily answers the door in a bathrobe. Great ending. What did you think of this Gossip Girl episode? What were your favorite and least favorite aspects last night? Comment away and vote below! OMG, so awesome. Pretty freaking good. Eh, it was okay I guess. Not a big fan at all. WTH was that crap?! Dorota's family. She practically raised Blair! Permalink: Dorota's family. She practically raised Blair! Blair: [to Chuck] I don't like who I've become with you. Chuck: Wait, Blair, don't bail on me, we have to see this through to the end. Gossip Girl Round Table: "The Unblairable Lightness of Being"